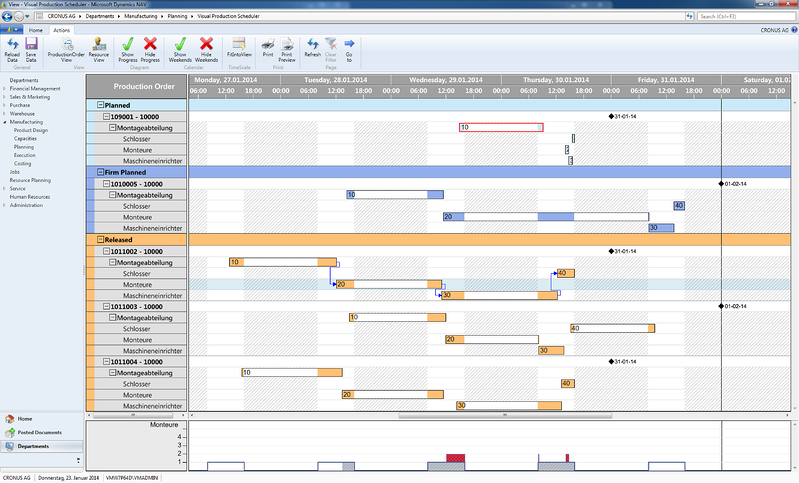 NETRONIC Software GmbH, a leading supplier of interactive Gantt chart software today announces the release of the Visual Production Scheduler for the role-tailored client versions of Microsoft Dynamics NAV. With this add-in, NETRONIC closes a gap in the versions 2013 and 2009R2 of Microsoft Dynamics NAV by supplying a fully integrated, interactive graphical scheduling board. Manufacturing users of Microsoft Dynamics NAV can improve the quality of their short-term production planning by applying the add-in. Version 1.0 of the Visual Production Scheduler for Microsoft Dynamics NAV is available as of today. It will be sold globally by Microsoft Dynamics NAV partners. NETRONIC will present the Visual Production Scheduler at its booth (hall 5, A21) at CeBIT. The role-tailored versions of Microsoft Dynamics NAV (2013 and 2009R2) do not have any integrated scheduling board although this kind of visualization has been proven in time-centric scheduling processes and had been included in a basic form in previous versions of Dynamics NAV. As this former production scheduler had been developed on the basis of NETRONIC’s Gantt chart component VARCHART XGantt, NETRONIC decided to close the gap in the latest Dynamics NAV version by developing own Gantt chart add-ins. The now released product – called Visual Production Scheduler – enables Microsoft Dynamics NAV users to improve their production scheduling quality. This is achieved by visualizing production orders, due dates and capacity needs at one glance, and by providing planners with the ability to interactively change all these parameters. This kind of transparency alongside with the immediate visual scheduling interactions result in an improved capacity utilization and hence in stronger delivery dates commitments. Users can work with the Visual Production Scheduler in an intuitive fashion so that they merely require any kind of special training. The Visual Production Scheduler is entirely based on the .NET framework and initially concentrates on data from the production module. The add-in is implemented as a Microsoft Dynamics NAV page, which allows integration in real-time. The drag drop functionality enables rapid scheduling actions. Data-driven visualization provides optical warnings in case intended scheduling changes would create any conflict. The Visual Production Scheduler comes with multiple scheduling views and comprehensive print functionality. The Visual Production Scheduler is available as of today (28 February 2013). Users of Microsoft Dynamics NAV can purchase the Visual Production Scheduler through their local Microsoft Dynamics NAV VARs. NETRONIC will present the Visual Production Scheduler at its CeBIT booth in hall 5 stand A21 in the period from March 5 to March 9 2013 in Hannover (Germany).